More than a hundred towns in New York have enacted local bans or moratoriums on gas drilling, including the controversial process known as hydraulic fracturing, or "fracking," in which drillers blast millions of gallons of chemically treated water into the ground to extract gas from hard-to-reach deposits deep in the earth. Among those municipalities is the Town of Dryden—which is now being sued. In September of 2011, the privately-held Anschutz Exploration Corporation, owned by Forbes-ranked Phillip Anshutz (net worth: $7.5 billion), sued the Town of Dryden (population: 14,500) in a bid to force the town to accept industrial gas drilling—including fracking—within town limits. The company brought its lawsuit after the Dryden Town Board approved a change in its zoning ordinance, clarifying that oil and gas development activities, including fracking, were "prohibited uses" of land within the town. The Dryden Town Board's unanimous, bipartisan vote followed a petition drive and a series of public hearings, in which residents spoke out 3-to-1 in favor of the change. This is how it all started. The Dryden Resource Awareness Coalition (DRAC) was created in the spring of 2009 by Dryden residents concerned about the possible upcoming consequences that the hydraulic fracturing of gas wells drilled into the Marcellus Shale may bring not only to their own neighborhoods, but also to the state and region. In 2010, DRAC members began collecting petition signatures from their fellow residents to ask the Town Board to develop an industrial noise ordinance and to make a firm statement against gas drilling. The journey to the successful passage of the ordinance involved the entire community, through information sessions, a listening project, collaborations with neighboring communities, and much more. DRAC members took their concerns and requests for protective action to the Dryden Town Board, using their citizens' privilege time at the beginning of each meeting. They attended each monthly meeting, reiterating their concerns and reporting on progress to the Dryden Town Board and Town Supervisor. Fracking requires a heavy industrial buildup, complete with giant well pads containing multiple wells, miles of trucks rumbling down gravel roads, and noisy equipment that runs all night. Fracking sites, which are significant sources of volatile organic compounds, also taint local air quality by increasing ozone levels. And then there's the issue of water. Each fracking job requires millions of gallons of water laced with sand and toxic chemicals like formaldehyde and hydrochloric acid. Some of the chemicals in fracking fluids are known carcinogens and the health effects of many additives are not fully understood, in large part because industry officials have refused to disclose precisely what they are using. "The people of Dryden want to preserve the special character of our town and make sure it continues to be a healthy community for generations to come," said Dryden Town Supervisor Mary Ann Sumner. "The oil and gas industry may wish it were otherwise, but municipalities have the right to determine what types of development are appropriate within their borders. We are firmly committed to defending that right." A New York State Supreme Court ruled in favor of Dryden in February of 2012. The case was then heard by an appellate court—though with a change in plaintiff. Norse Energy, the U.S. subsidiary of a Norwegian oil and gas company, has replaced Anschutz Exploration in the litigation—Norse then filed for Chapter 11 Bankruptcy proceedings the following month. In May 2013, a four-judge intermediate appellate court ruled unanimously in favor of the Town of Dryden, its second court victory against the fossil fuel industry. 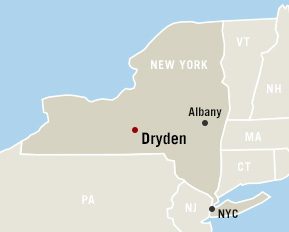 Earthjustice and the Town of Dryden now are engaged in a third round of litigation, as the case is now in New York’s highest court. Norse is liquidating its assets, and the bankruptcy Trustee is pursuing the final appeal. The case is being watched closely as towns in other states like Colorado and Ohio pass fracking bans of their own and are threatened with lawsuits by the oil and gas industry. A victory in New York could provide encouragement and hope to communities around the country. "The people of Dryden stood up to defend their way of life against the oil and gas industry. And, against stiff odds, they won," said Deborah Goldberg, managing attorney of Earthjustice's Northeast regional office and an expert on the environmental impacts of industrial gas development. "The [lower court] ruling makes clear that local officials have the right to decide what industrial activities are appropriate within their communities." On June 30, 2014, the New York Court of Appeals ruled that the towns of Dryden and Middlefield can use local zoning laws to ban heavy industry, including oil and gas operations, within municipal borders. The decision gives legal backing to the more than 170 New York municipalities that have passed measures to protect residents from the impacts of the controversial oil and gas development technique. The news also gives a green light to dozens of other New York towns that have been waiting for the Court of Appeals' decision to pass their own local ban.